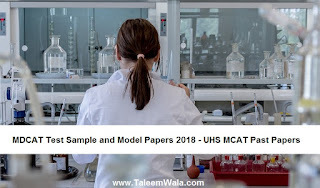 Now download these free sample papers, past papers and model papers of MDCAT or in other words Mcat papers by UHS. We have uploaded these example papers with question papers to make Pakistani students easily prepare for their Self Assessment Entry Test (MCAT). There is no practice test need after you download these mcat sample question papers and you will able to answer questions which will be asked to you in the exams. If you are not satisfied then share your problems in comments and let us help you or other students will answer your questions. Also if you think its a great resource for mcat sample papers then share this article with your fellow students across Pakistan.